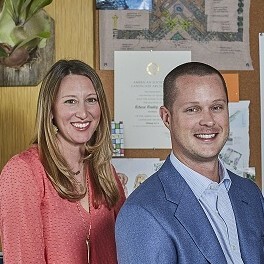 Rebecca Bradley and Gage Couch, Owners of Cadence, are not your typical Landscape Architects. From their gorgeous portfolio of projects to their masterpiece of a website to their core values and ethos that drive their business decisions, Rebecca and Gage have created something incredibly special and meaningful. What started as a casual conversation over drinks at the height of the Great Recession has turned into a thriving business impacting more than just the South Florida Landscape. Rebecca took us back to the beginning. "Before the market crashed, I worked in the corporate design world for nearly a decade," she said. "I was in it for the peak and experienced the highs of 2002-2007. Gage and I first met after being recruited to work for a large design firm headquartered in Fort Lauderdale. By 2010, the downturn was in full swing and for the first time in our professional lives, we saw the uncertainties of that world and felt like we could do things differently. We knew that a partnership would allow us to do high quality design work and transform the way we communicated with our clients and the public. There were certain pieces missing in the corporate world. We wanted to do work that mattered. We also wanted more control over the type of clients we worked with." Gage added, "Things materialized pretty quickly and three months later it was go time." From the beginning, Rebecca and Gage were committed to doing things their own way. They're guided by strong values and beliefs that impact every decision they make. "We bootstrapped the entire thing," said Rebecca. "That, along with being lean, was important to us then and it still is now. We grew in a small, sustainable and smart way," she said. Gage added with a laugh, "We actually shared a laptop for our first few months in business." What helps to make Cadence tick is how well Rebecca and Gage work together and how well their values align. "We share the same ethical values," said Rebecca. "We're in agreement with how we want to perform as professionals, how we treat our employees and what kind of lifestyles we want to create. We spent a lot of time in the early days defining what the ethos of the company would be. We built a strong brand and a strong culture built on those ethos. We actually have a big graphic display in our office that defines what we are and how we perform our jobs." "It's pretty simple," said Gage. "We follow the golden rule in business and in life. Treat others how you want to be treated." Even the name of the company, Cadence, has meaning and captures the rhythm of how Rebecca and Gage do things. Gage explained, "We knew we didn't want our last names in the business name. We wanted something more than just us. We wanted a strong name, so we hired a branding and marketing consultant out of Indianapolis to create our branding, identity and website. We told him we wanted a dynamic name and something that embodied how we design and do business and approach projects. He sent a questionnaire to our early clients, colleagues and friends asking about their personal experiences and business relationships with us. From the responses, he derived several different names. Cadence was our favorite and it's very fitting. There's a rhythm and a certain cadence to how we do things. You can see this balance in nature and also in our projects." Like most entrepreneurs, Rebecca and Gage have experienced a few hurdles along the way. Finding talent at the level of design combined with the personal ethics they're looking for has been a bit of a challenge. Rebecca explained, "Florida only has two accredited universities that offer landscape architecture and together they produce very few graduates each year. Combine that with the high cost of living in South Florida and finding talent can be tough. Property values are also going up which makes it difficult to find affordable office space in a good location." Rebecca and Gage also added that with the onslaught of Pinterest and Instagram, and the spectacular visuals that accompany these social media platforms, it can be hard to bridge the gap in people's minds between what's actually possible and what would require an enormous investment. The future looks bright as both the private and public sides of the industry are beginning to better understand and embrace the importance of green infrastructure, public space and climate change. It's a heavy lift for these organizations that are faced with major infrastructure improvements to keep up with the changes, but Rebecca and Gage believe things are moving in the right direction. "In the past, outdoor space would be looked at as "leftover" space," said Rebecca. "Outdoor space should be the first thing you think about. It's important to take a holistic approach to determine how we can best integrate with nature and our surroundings." They're also seeing business pick up on the residential side as more and more homeowners are putting off extravagant vacations and instead focusing on improving their exterior living environments. Rebecca and Gage offer up some great advice for aspiring entrepreneurs. "Stay patient, stay positive and stay persistent," said Gage. "Don't be afraid to collect your bills. We also always tell our team members to get comfortable with being uncomfortable." Rebecca added, "It's the only way to do meaningful things." They recommend applying knowledge, innovation and business strategies from parallel industries to help solve challenges and apply solutions within your own field. Much of their values and the ways in which they conduct themselves, both personally and professionally, have been influenced by the writings of Seth Godin. They recommend his book Linchpin and his daily blog posts. They've also been inspired by Liz Lambert, Gary Vaynerchuk, Daniel Pink and the socially responsible business model behind Toms Shoes.